The Chinese Zodiac, is an ancient scheme that relates each year to an animal and its reputed attributes, according to a 12-year mathematical cycle. 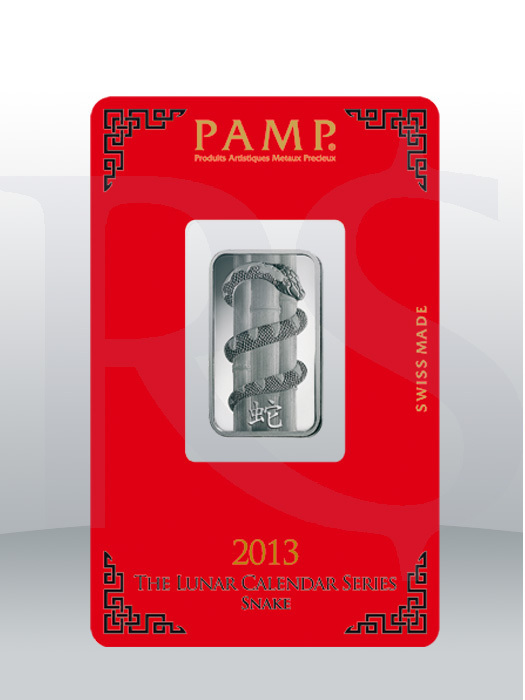 PAMP's highly popular series of Lunar Calendar ingots in fine gold or silver celebrates the tradition of gift of good Fortuna giving with unexpected designs that delight and captivate, front-to-back. Further honoring ancient custom, distinctive CertiPAMP packaging and quality envelope-like sleeves lend each ingot to instantaneous and memorable gift giving. 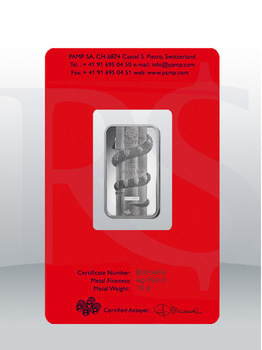 Each PAMP Suisse Lunar Snake Silver bar contains 10 grams of .999 Fine Silver. Each bar bears a unique serial number as well. The snake motif is employed to celebrate the traditions, customs, and culture of the Far East. The coil and texture of the snake’s scales as they wind up the pillar is an outstanding mark of this bar’s artistry. Beneath the snake is the Chinese character for ‘snake’ which is an extraordinary detail that complements the overall design. 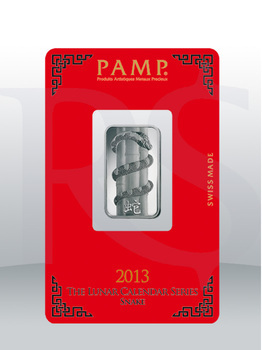 The PAMP Suisse Lunar Snake 10 grams Silver bar measures 31mm x 18mm with thickness of 1.81mm.